The International St. Lawrence River Board of Control is now the International Lake Ontario - St. Lawrence River Board. The Board implemented Plan 2014 to ensure that releases at the Moses-Saunders Dam comply with the International Joint Commission's 8 December 2016 Supplementary Order effective January 2017. Please refer to Regulation Plan 2014 for the Lake Ontario and the St. Lawrence River Compendium Document for details. Updated details on the new plan will be posted to this website in the months to come. The Board’s main duty is to ensure that outflows from Lake Ontario meet the requirements of the IJC order. 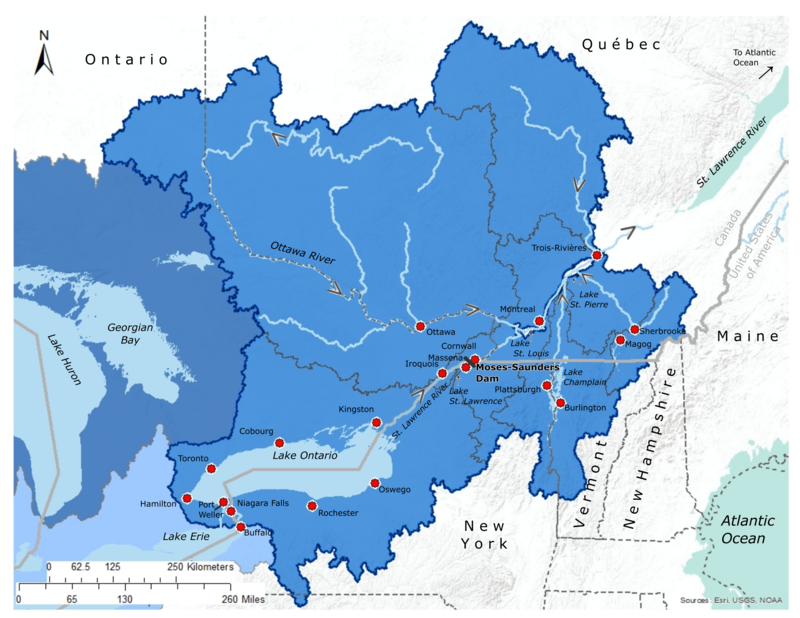 The Board also has responsibilities to communicate with the public about water levels and flow regulation, and work with the Great Lakes – St. Lawrence River Adaptive Management (GLAM) Committee to monitor and assess the performance of the regulation plan. NEW REPORT ON 2017 LAKE ONTARIO AND ST. LAWRENCE RIVER FLOODING -- A report released today by the International Lake Ontario-St. Lawrence River Board (the Board) provides a detailed account of the historic 2017 flood, and the Board’s actions under Plan 2014 to regulate Lake Ontario outflows in the face of high inflows and record-breaking precipitation. Water levels across the Lake Ontario - St. Lawrence River system have now begun their typical spring rise, but several months of high outflows combined with favorable winter weather conditions has levels back within their normal range and well below those seen during the historic high water event that began about a year ago. Sign-up to receive weekly summaries on Lake Ontario outflows.